Colorado licensed acupuncturists receive acupuncture continuing education credit toward NCCAOM license renewal. All acupuncturist courses are NCCAOM approved for continuing education credits. As a licensed acupuncturist in Colorado, you may obtain PDA points towards renewal of your NCCAOM course for Acupuncturists. See Rule 1: Requirement for Licensure, Section (B) – To satisfy the licensure requirement in Section 12-29.5-104(3), C.R.S., the Director requires an applicant to have a current certification at the time of initial license application by the National Certification Commission for Acupuncture and Oriental Medicine (“NCCAOM”) or a successor organization. Continuing education have gained popularity among licensed professional in recent years mostly because of their convenience. There are lots of licensed professional, who are required to complete continuing education in order to renew their licenses such as in Acupuncture. Continuing education unit is generally used to indicate a participant’s presence for 1 hours per year in an accredited continual education courses. The completion of a specific number of continuing education units is mandatory requirement for acupuncturists to licensing boards for renewal and validation of their professional certification or license. 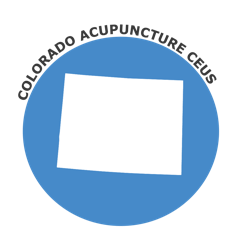 Since the passage of Colorado’s Acupuncture Practice Act, in it has been possible to determine those fully-trained and licenses professionally by looking at their credentials “L.Ac.” or Licensed Acupuncturist. In Colorado, acupuncturists are licensed by the Department of Regulatory Agency, Division of Professions and Occupations. To maintain NCCAOM certification diplomats must re-apply every four years and complete minimum requirements in continuing education in core competency or a combination of continuing education and professional enhancement. The state of Colorado requires NCCAOM Certification in order to renew an Acupuncture license. Browse NCCAOM PDA or CEU Courses. *Colorado Acupuncture Continuing Education Requirement – none. Practitioners who are certified by the NCCAOM must initially pass a series of written board exams and subsequently earn a minimum number of continuing education credits every 4 years. The state of Colorado DOES NOT require licensed acupuncturists to complete any continuing education in order to renew their licenses. All acupuncturist licenses expire on December 31 of odd numbered years and must be renewed to continue practicing. Renewals open approximately six weeks prior to the expiration date.